Mark Suri devotes the majority of his practice to all aspects of intellectual property law, including patents, trademarks, copyrights, unfair competition, and trade secrets. Mr. Suri also has extensive litigation experience, which he uses to help clients avoid litigation. As part of his intellectual property practice, Mr. Suri also works on a variety of licensing matters and other transactions, including mergers and acquisitions. 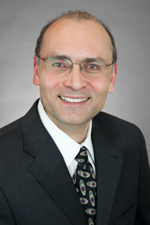 Mr. Suri has represented many clients in a wide variety of industries, including publishing, insurance, lighting, graphic design, software development and consulting, and e-commerce, as well as clients in manufacturing industries such as restaurant equipment, adhesives, automotive, machine tool, athletic equipment, furniture, and plastics. Prior to joining Hinshaw & Culbertson LLP, Mr. Suri was a name partner at a Chicago intellectual property boutique. Prior to that, he was a partner at a large Chicago law firm. Upon graduation from law school, Mr. Suri served as a law clerk to the Honorable Michael J. Melloy, Chief Bankruptcy Judge, Northern District of Iowa. His law school accomplishments include having been a member of the Order of the Coif and writing and editing for the Journal of Corporation Law. The patent owner in a patent infringement case on lighting technology that resulted in a $23 million jury verdict and a finding of willful infringement against an auto manufacturer. The patent owner in a patent infringement case involving hospital bed technology. After extensive discovery, Mr. Suri successfully settled the case and obtained a substantial recovery for his client. A defendant in a copyright infringement dispute concerning designs on clothing that included Olympic symbols. A dismissal of the case was obtained soon after it was filed. A gaming company in a dispute against another gaming company for trademark infringement. A very favorable resolution on behalf of the trademark owner, Mr. Suri's client, was obtained. A specialty chemical company acquisition. "Computer Fraud and Abuse Act," 2014 Illinois Entrepreneurship and Small Business Association Conference, Normal, Illinois, May 2014. "Joint Development Agreements: Protecting Intellectual Property," National Business Institute, webinar, May 2014. "Intellectual Property Issues in Bankruptcy Proceedings," Bankruptcy and Commercial Law CLE, Iowa City, Iowa. "Lawmen of the Internet," Nth Degree Legal Conference, Chicago, Illinois. "Electronic Check Patents: What Do You Need to Know?" NACHA Payments Conference, Atlanta, Georgia. "The Internet's Impact on Managing and Policing Trademarks," International Legal Strategies. "Avoid Online Copyright Infringement Liability," Association Management. "Contracting with an Online Service Provider," Association Management.